Ruchir Karmali, PhD, is a Delivery Science Fellow at the Kaiser Permanente North California Division of Research. She holds a BS degree in Biomedical Engineering and MS degree in Public Policy from the Georgia Institute of Technology and a PhD in Health Policy and Management from the University of North Carolina-Chapel Hill. She also completed a predoctoral fellowship at the Duke Clinical Research Institute. Dr. Karmali’s research has employed decision science, systems science, and econometric methods to evaluate and improve population health. Her interests focus on understanding how multi-level factors (providers, geographic, and health system characteristics) affect individual behaviors and outcomes in the context of chronic disease management. 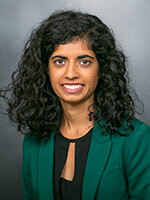 Her recent research examined how access to non-pharmacologic pain management services is associated with opioid use among older adults with chronic pain.